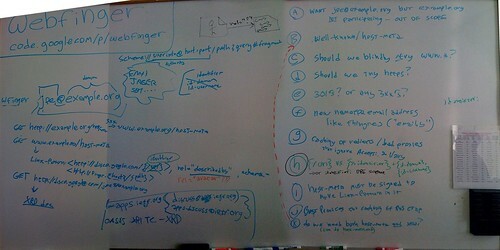 Last week for two days I was at the W3C workshop on usability and authentication. It was hosted at the top of a citibank building in Brooklyn. We had to present ID at the door to get upstairs. The room was a very long rectangle room with three presentation screens and 2 giant columns. It is a terrible lay out. The first morning we heard 3 ppt presentations about ‘the problems’ of for usable security and authentication. Maybe people are 1/2 present doing e-mail and other things. I really wanted to interactively (as in facilitated face to face discussion) create a map of the problem space. By the end of two days I sort of got it but I know we as a room could have come up with that in 1/2 a day and then sent the rest of the time really working on ideas for solutions. There are a bunch of constituencies. Big websites – AOL, Yahoo, Google. They all want security of verifying websites to be more usable and understandable to normal folks. So there was usability experts. I think I understand why ‘standards bodies’ and processes get bogged down. They are really not very innovative in their face to face technology – presentations for a two days do not create a positive energetic vortex and community to move forward on solving problems. I am really tuned into this need to get better at our face to face process so our ideas and innovations for the online world can actually work. So I started using MeasureMap several months ago the first week it was live . I LOVE it…but it just got bought by Google. I am not a big fan of Google these days…now they have all the traffic and links on my blog. Are they going to start charging me for this service? How do they monazite this service? I have no problem with them making money but as a user of the service I would like to know exactly how they plan do it and plan it.